A loan of $2,750 helped to buy equipment for producing ice-cream, which will be her new business. Matluba is a woman who has a good ability for managing a business. She is 37 years old, married, and has three children. Her husband is not a very lucky man, and he is not able to earn money. Matluba has been busy, selling DVD discs in the local market, for more than six years. Now, she plans to organize a new business producing and selling ice-cream. She studied at the course ‘To Get Ahead’ at a women's organization, and she made perfect her knowledge about business. Her daughter will help her with the new business. She will produce ice-cream to sell in the local market. Beginning this month, it is a good season for the ice-cream business. She is asking for a loan of 13,000 Somoni, which she will use to buy equipment for producing ice-cream. She awaits your support. This loan will help her to find a new source of income and improve her family's living conditions. This loan is part of IMON International's startup loan program called Sarchashma ("spring" in the local language). Sarchashma loans are tailored to women who have feasible business ideas but lack the funds to get started. 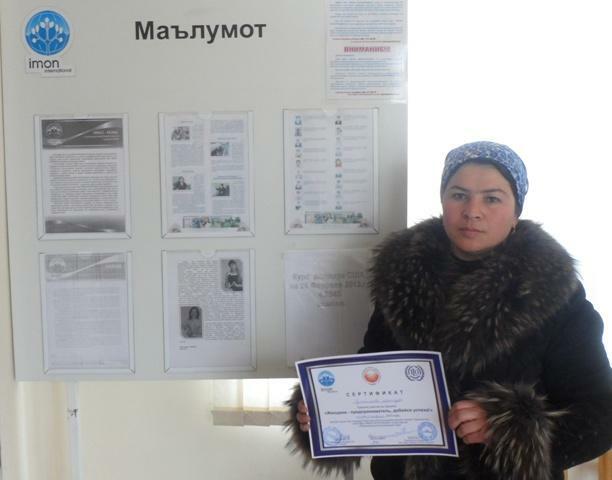 In addition to credit, these women also receive special training from the National Association of Business Women of Tajikistan to develop business plans. They also have the opportunity to participate in IMON's "Woman Entrepreneur, Get Ahead" program, a three-day intensive training course. By funding this loan, you are supporting borrowers who have limited options to start and grow small businesses. This has the potential to alleviate the effects of poverty, significantly improving borrowers' incomes and their families' quality of life. IMON International (IMON) is a micro-deposit organization in Tajikistan that provides entrepreneurs with access to high quality financial products and services, including business loans, agriculture loans, consumer loans and micro-leases. Aiming to alleviate poverty, the organization helps unbanked individuals establish businesses in different sectors, including manufacturing, agriculture and service. Kiva lenders' funds will help the organization to expand its outreach to even more entrepreneurs, farmers and traders in Tajikistan. IMON International works in the poorest of the former Soviet Republics, providing sustainable and well-adapted products to low-income and rural communities. It offers a wide range of financial products to support start-up and existing businesses, agricultural production, and micro-leasing for small manufacturers. It also offers emergency loans and specialized loans for housing to help borrowers improve and maintain their families' quality of life. IMON uses the money it saves on Kiva's zero-interest capital to provide financial education and start-up business classes for first-time entrepreneurs. It also subsidizes a joint program with Habitat for Humanity that sends engineers into the field to help borrowers design and execute energy-efficient home improvements. Like Kiva, IMON is committed to alleviating poverty and helping unbanked people improve their living standards. Since 2008, the organization has helped over 50,000 clients by providing a diverse range of loan products including agriculture loans, start-up loans, business loans, consumer loans and micro-leases. IMON’s vision is to combine micro-lending with micro-deposit services to provide access to high quality, innovative and transparent financial services. Kiva is happy to support IMON and help the organization impact more people.